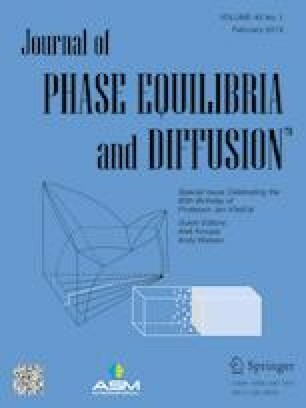 Phase equilibria of the Al-Mn-Sn system were investigated by means of x-ray powder diffraction, scanning electron microscopy and energy dispersive spectroscopy. Two isothermal sections of the Al-Mn-Sn system at 450 and 800 °C were experimentally established. No ternary compound was found at those two temperatures. The low-temperature phase Mn3Sn2 was observed at 450 °C. The solubility of Al in Mn3Sn, Mn3Sn2, MnSn2 and that of Sn in Al8Mn5 at 450 °C is about 3.1, 2.9, 0.6, and 1.7 at.%, respectively. The high-temperature phase Mn2-xSn was observed at 800 °C. The solubility of Al in Mn3Sn, Mn2−xSn and that of Sn in Al8Mn5 at 800 °C was measured to be 2.8, 3.6 and 1.0 at.%, respectively. Al12Mn, also named G phase, was proved to be stable at 450 °C. Financial supports from the National Science Foundation of China (Grant No. 51671036) and projects funded by the Priority Academic Program Development of Jiangsu higher education institutions and by the Education Department of Jiangsu Province (17KJA430001) are greatly acknowledged. This work has also been sponsored by Qing Lan Project.